I adore pretty cards. I always go onto Papyrus or Hallmark to look at their new designs, I have even created a Pinterest board to save those that I like most. 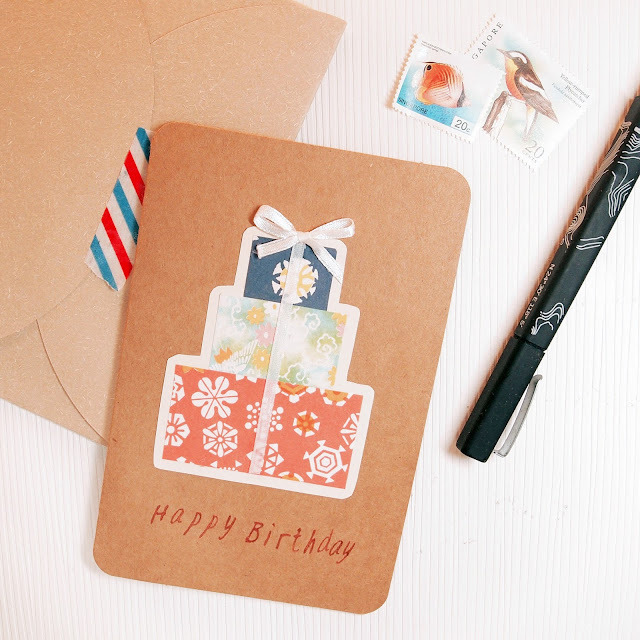 I think cards are both visually pleasing and functionally practical for special occasions, such as birthdays, to write down my thoughts, blessings and gratitude for friends that I care about. Having the craft materials lying around at home and being inspired by the designers' creation, I gave an attempt on making a card myself. I decided to start easy and used only simple materials: just some washi craft paper, those that are used for making paper cranes; a thin ribbon, stiffened with glue for easy attachment onto paper; and alphabet stamps with ink pad. The hardest part for me is to match the washi paper in which the three designs will compliment each other. From there, it is just simple cutting and pasting to create three tiered layers. To add contrast, the washi paper was sticked onto an ivory paper. Ribbon was attached with white glue, and words were stamped while waiting the glue to dry. I also added a sheet of white paper in the card to write things on, which I believe is better than writing directly on the brown card.